Are you comfortable wearing your black belt? No, I am not. I have never been truly comfortable wearing a black belt. It holds a special meaning to me and to this day I have difficulty wearing it in front of people. When the day came I was told that I could wear a red and white paneled belt. I had more ease wearing that then the black belt. I suspect it was because on some subconscious level it relieved me of wearing the black belt. The black belt can be intimidating. I used this mind-set to remind me to leave my comfort zone. I try to do that as much as possible without going so far that my health suffers for it, i.e. anxiety, stress, etc. I want it to be beneficial so I can use it in the proper context. As I assumed higher levels of the black belt I would have a bit more apprehension when I would put my obi on. Is this because psychologically I am placing too much emphasis on the power of an inanimate object? Am I giving this symbol too much power and importance? It depends on just how much I give it and how much I allow it to cause discomfort. I believe the discomfort is a positive thing much like my use of it as a reminder to live outside the comfort zone as needed. I do feel that the black belt is given way to much importance in the dojo and in the martial arts community. Other than the importance that an individual decides to give it for themselves it is not all that important in the community itself simply because it is an individual perception and perspective and that is the way it should be for that person. 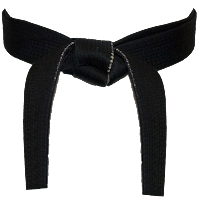 The black belt in essence is simply a symbol that a person has reached a level of knowledge, experience, training and practice that says they are a serious practitioner. It symbolizes their personal commitment to their efforts in this discipline. It is also a symbol that signifies the obligation one assumes as it relates to their commitment to the system and the relationship with others in the same discipline. It can be a symbol that one has committed themselves to their betterment and the leadership that assume to provide example to others who may want to follow the systems path, the same path as the black belt wearer is walking. It symbolizes a huge responsibility to the individual that transcends the self, the ego and the pride of that individual. 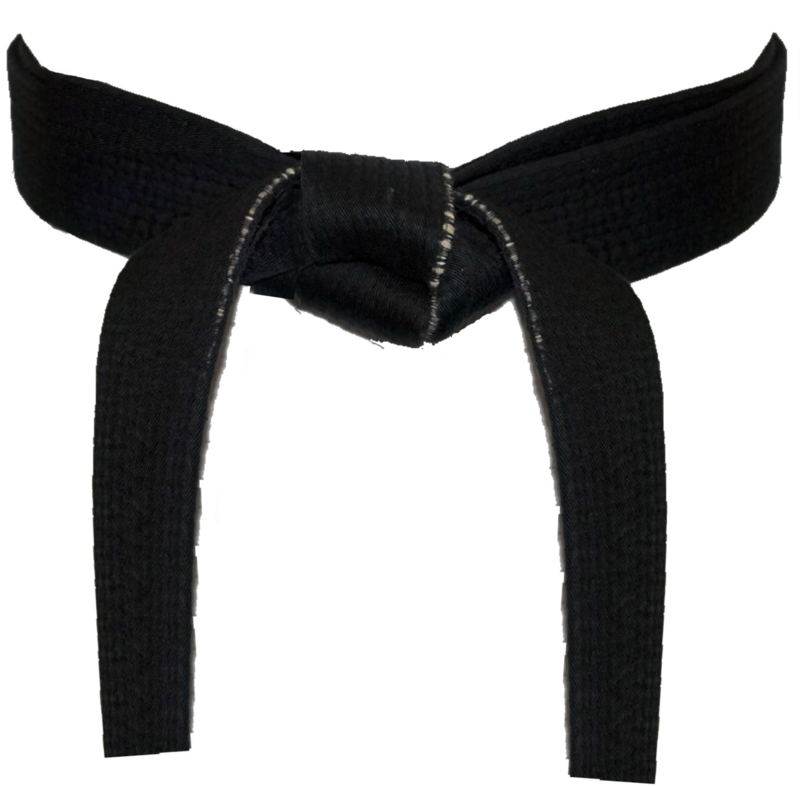 The black belt symbolizes a desire for constant improvement not only in the system but in the self and through actions and deeds influence those who choose to associate and dedicate themselves to a discipline. When I put on the black belt I often think of my responsibilities to others and to myself and am humbled by the immensity of that commitment and the resolve I have to meet it. It reminds me that I still have a way to go and that I have come far. When I think of the black it symbolizes the blackness of the space that surrounds the entire universe that has not true measurable depth or breadth but limitless and all encompassing. The fact that we create a circle, a circle symbolized infinity, with it around our waste, hara, we are reminded along with the blackness of the belt that it is all encompassing, vast, huge and immeasurable. The same is said to where we were, where we are and where we are going. So, yes, the discomfort I feel every time I put a black belt on speaks to me of things that are important to what I do, say and believe. It is a culture and belief that supports and supplements my life and how I live it. Yet, it is just a cloth colored black that wraps twice around my waist giving me the discomfort yet supporting and holding me fast to my commitment to be the best I can be and to pass that along to whomever chooses to listen. Black belt, not much but still a lot. Depends on you and how you look at things. I talk to much! What makes a system good for self-defense? This is such a difficult question and I believe there are not pat answers. Regardless, I will try my best to answer it from a very narrow perspective, i.e. my perceptions as to what it is that makes a system good for self-defense? This answer does not contain specifics such as when this happens you do this technique or combination, etc. This is a very small part of SD training and practice but it does not cover all the bases. First, what is the systems syllabus? It is important to make sure a system for SD encompasses all the aspects involved in self-defense. It should address the before, during and after of any violent conflict. It must span from before you encounter it, while you are in it and then what happens after it occurs. Second, if must begin with what you need to know in order to recognize all violence. It must encompass those mind-set training that prepare the mind long before you go out and expect it to work. It must provide a solid knowledge of what violence is and how it works in all varieties. It all must be realistic. Third, it must also allow for a reality based training and practice regimen that begins with the practice and training of what, when, how and why things lead you into conflicts. It must allow for the reality based training and practice that gives you the tools to handle things before you encounter conflict. It must allow for a reality based training and practice of what you need to accomplish when in a conflict zone and it must cover all the variables for that moment of conflict, i.e. each moment is unique and training and practice must address this. It must allow for a reality based training and practice for what you need to know, understand and do when you leave the conflict, i.e. the repercussions and after affects. Fourth, look to the instructor to see their history and experience. If they don't have a lot of experience or if their experience is within the system itself or if there is no experience in violent conflicts then look to their sources, look to their training and practice history, look to the same in their sources as well. If it fails to address the before, during and after; if it fails to address the mental/psychological, the spiritual, and the physical; if it fails to address the mental/psychological, legal and civil repercussions then your system needs further self-analysis to encompass all aspects of self-defense. It is too easy to drop into the particulars of SD including falling prey to the influences of advertisements and claims of any system. It is easy to succumb to the thrills found in all martial systems or any SD system. It is easy to fall prey to a perceived expert in a SD system. Remember that SD is serious business. It has far reaching repercussions that will affect your entire life after, your families entire life after and your economic stability for your entire life after. In closing I want to say that this short terse post on what makes a good self-defense system is not all encompassing but rather a means to make you think long before you rely heavily on your local self-defense school. Buyer beware. The after of all SD is something you will deal with for a long, long time. Your ability to handle it before, during and after depend on your foundation of knowledge and experience. Failure to go the distance in your own behalf is your sole responsibility. If you fail to choose wisely you will have to look to yourself simply because you are the one choosing and deciding on your SD system. p.s. as to SD systems, all systems have the potential to be good. All of them have the potential to be horrible. You can find a solid SD system if you do the footwork first and choose wisely. It could be anything and don't allow anyone to tell you one is either good or not good for SD, make that decision yourself. Why are martial arts weapons illegal? Well, a complex question with a complex answer. You say now, not so Charles yet it is true. It is like describing the complexities of self defense and that in my view is the crux of the issue. This may apply to all perceptions as to weapons and legalities. First, it is about perception. The laws are often created due to misconceptions by society. This is fed by media manipulation. The way the news depicts things, etc. that are from ignorance and a lack of effort to truly seek out truth and knowledge. It is as natural as anything human, we just do this stuff naturally. Second, if society perceives it as an aggressive tool for doing violence then it will hardly ever be allowable for use in self defense or self protection. Even if in the home it can be perceived this way and result in prosecution and jail. If you have the ability in your home to run your obligated to do so within unspecified parameters and if you use some weapon then how you use it and when you stop using it can change home defense into violent aggressive attacks against that poor defenseless son of some family who say he was such a good boy who just happened to go astray type thing. Think I am kidding, they used stories similar to these in the NRA magazine, when I was a member so long ago, to get laughs, etc. In California it took just one incident that made the news, as if often the case, that inflamed the general population into perceiving such things as shuriken, nunchaku, etc. as deadly weapons so they became illegal. It is the way humans work at all levels. It is how misperceptions come about and it is life so live with it. Do you really need those weapons and do you really think that society, even if not illegal, will allow you to use them in defense? If they did, don't you think that how you use them, when you use them and the perceptions of that usage are going to most often lead to charges, trial and conviction? This just begs the question as to why all this stuff is not discussed and taught in most self defense training models. I guess it is just plain dumb luck since about 90% of all SD trainees and graduates will never, ever encounter such situations requiring SD actions. Avoidance and deescalation, etc. are the true fundamentals of self defense in my view. So, in closing, if weapons are made illegal then think outside the box on how you can avoid violence and if you can't how you can deescalate it and if you can't then how you apply self defense appropriately to not get too much damage, to escape quickly and to not get charged and convicted of fighting or violent conflicts, etc. Come on everyone, think about this stuff. Ok, off the soap box!